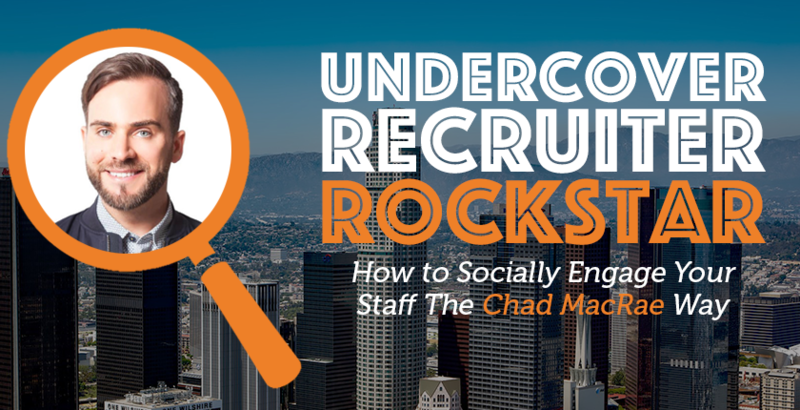 We speak to Chad MacRae who is a recruiting leader and design thinker with over twelve years of experience in talent acquisition. He is the founder of Recruiting Social, a recruiting services company that supports talent teams across North America and donates 10% of profits to education charities. He has found talent in 45 countries (Including the U.S., Canada, Greece, the U.A.E, and Afghanistan) and provided recruiting strategy to top organizations including OpenX, Hearts & Science (an Omnicom company), Grindr, Rubicon Project, and Activision. Why do candidates want to work with you? Aside from working with some of the best workplaces in North America, my design thinking background has equipped me to really understand the candidate perspective, paint an exciting and honest story about the organization, and deliver a positive candidate experience. Getting hiring managers to consider candidates with alternative backgrounds and qualifications – i.e., diversity. It’s important to get leadership, as well as all employees, directly involved – seeing the potential of people with different experiences, and building an inclusive workplace. For example, to help one of our global tech clients become more transgender-inclusive, we partnered with a local organization called TransCanWork. Every employee completed their training program and spent time learning from members of the trans community about this untapped pool of talent. You need a mix: employee referrals deliver faster time-to-performance. Sourced candidates present greater diversity and attract people you may not otherwise get. Last year, Recruiting Social was a named a Top 25 Most Socially Engaged Staffing Agency by LinkedIn. Anyone who’s started a business (like a recruitment company) has considered hiring a friend or family member. I’ve done this, more than once. But you need to really sit down and consider your business plan. Can that friend/family member help you get where you aim to go? Hire the person who will help you get there, not the person who is easiest to hire or most immediately available. Not giving feedback to a declined candidate. You never know. That person might not be the right hire now, but they might be the right hire for a future opening. Candidates remember a good – and bad! – experience. I’ve had candidates hired who, ten plus years earlier, I’d declined! And yeah, they remembered their earlier (positive) experience with me. What are your top 3 tips for recruiters? Go to conferences outside of the HR/Recruiting industry. Consider how you can contribute beyond the typical, req-to-offer hiring process. Netflix – I love all the video content they are doing, combining their consumer and employer brands. Check out #FirstTimeISawMe, an interview series with Netflix employees talking about the first time they saw themselves represented in a Netflix Original. Also, the #SheRules content highlights some of the women that work at Netflix and how they impact the work done at the company. AI: There are a lot of tools that will help with sourcing and screening candidates and we will continue to see a rise in use and adaptation with agencies and in-house recruiters. Scenarios Planning: Internal recruiting will continue to solidify their seat at the table with leaders and build their consultative approach. Organizations will have to move from a “forecasting headcount” culture to true scenarios planning, where they map out current state to future scenarios based on environmental factors. New Collar: When we look at talent, we will see continued growth of “New Collar” hiring. With coding boot camps and accreditations from organizations such as the General Assembly, we are going to see some organizations relax their narrow expectations of what school candidates went to and other illogical qualifications. Especially in more aggressive markets!